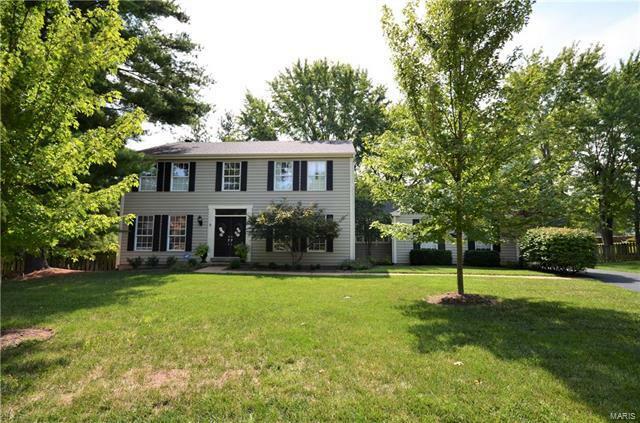 Gorgeous 2story home in the heart of Chesterfield. 2story entry w/fabulous chandelier is flanked by the office/den & dining rm. Newly refinished wood floors in the family rm w/white washed, woodburning FP, bay window & wetbar w/wine cooler that leads to the breakfast rm & kitchen. Kitchen feat large island, granite, 42" cab, stainless appliances incl GE Profile gas range & Whirlpool dishwshr, plantation shutters & a cute nook area w/bench & storage. Laundry rm & half bath complete the main floor. Upstairs to the Master Suite w/cust sliding barndoors leading to the walkin closet & bathrm, complete w/2 vanities, shower & soaking tub. The upper level also incl 3 guest rms & full bath. Finished LL w/recrm makes for the perfect mancave or play/game rm w/plenty of room for storage. Outside feat a patio that overlooks the level fenced backyard that is great for kids or pets! This home has too many updates to list. Check out the special feat sheet for more info! Newer roof, driveway & HVAC. Clarkson rd to North on Wilson Rd. Right on Bent Tree to right on Windfall Ridge to left on Windfall Ridge court.